owners/operators of such platform lifts used by people with impaired mobility, installed at their premises. inappropriate or poor maintenance of such components/safety devices. Safety devices are designed to prevent doors from opening unless the platform lift is at a landing. Tampering with safety devices may allow the doors to open when the platform/lift car is not at the landing. This could result in a significant risk to the users of falling from height or being crushed. Platform lifts (vertical lifting platforms), like traditional passenger lifts, provide access between floors. Platform lifts are hydraulically or electrically powered. Usually, they operate over two to three floors. They typically rely on hold to run operation and operate at slower speeds than conventional passenger lifts. HSE is aware of a number of incidents involving tampering with safety devices or inappropriate maintenance of door switches or unlocking zone bypass switches during maintenance. Combined with the deterioration of the doors and their hinges, landing doors have opened when the platform/lift car is not at that landing. This resulted in people potentially accessing the lift well when the lifting platform was not on the same floor level/landing. This has resulted in members of the public or workers falling down the open lift well or becoming trapped beneath a descending platform. Three incidents occurred on early model Nami-lift 400 platform lifts in the serial number range from 2433 (installed in September 1999) to 4225 (installed in December 2006). These lifts incorporate Bowden cables to control the door locks, which are more susceptible to incorrect adjustment. Bent door lock switch contacts – The contacts on door lock switches have been bent to increase the switch contact force; however, this can prematurely signal to the control system that the door is locked, allowing operation of the lift platform when the locking pin is only partially engaged with the latch plate. Poor adjustment of unlocking zone bypass mechanisms, meaning that the switch remains permanently activated, allowing the platform to travel between floors with the landing doors open. Lift maintenance companies should ensure maintenance activities are undertaken by competent personnel; in line with the manufacturer’s instructions and/or guidance; and in accordance with a safe system of work. 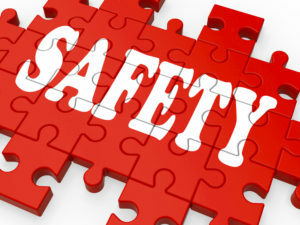 Maintenance of the safety elements of the lift must not affect its safe operation. Modifications intended to keep a lift operating but which may result in unsafe operation must not be carried out under any circumstances. The checks should be carried out by a person who is competent to do so.